Hungarian rabbi; born at Grosswardein July 8, 1863; educated at the local gymnasium and the rabbinical seminary and at the University of Budapest (Ph.D. 1885; rabbinical diploma, 1887). From 1887 to 1890 he officiated as rabbi at Somogy-Csurgó, and in 1893 became professor at the Jewish normal school at Budapest. In the following year he was called to the Lehranstalt für die Wissenschaft des Judenthums in Berlin as instructor in Jewish history and the philosophy of religion. 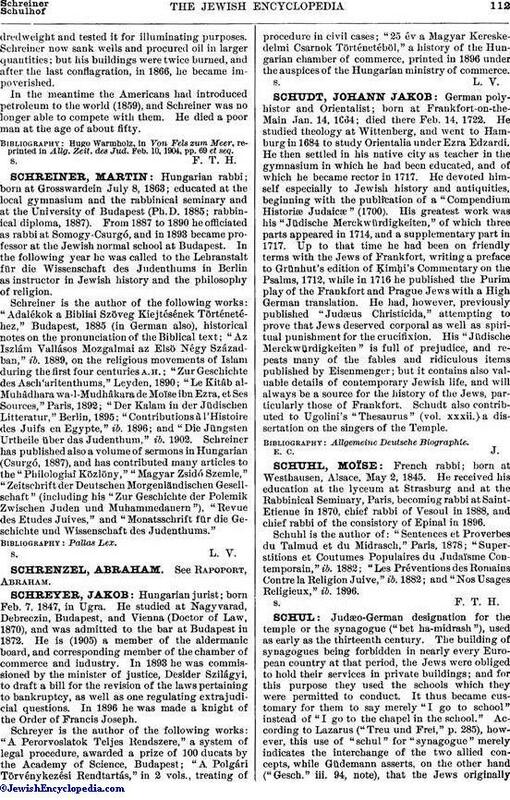 Schreiner is the author of the following works: "Adalékok a Bibliai Szöveg Kiejtésének Történethez," Budapest, 1885 (in German also), historical notes on the pronunciation of the Biblical text; "Az lszlám Vallásos Mozgalmai az Elsö Négy Században," ib. 1889, on the religious movements of Islam during the first four centuries A.H.; "Zur Geschichte des Asch'aritenthums," Leyden, 1890; "Le Kitâb al-Muhâdhara wa-l-Mudhâkara de Moïse ibn Ezra, et Ses Sources," Paris, 1892; "Der Kalam in der Jüdischen Litteratur," Berlin, 1895; "Contributions à l'Histoire des Juifs en Egypte," ib. 1896; and "Die Jüngsten Urtheile über das Judenthum," ib. 1902. Schreiner has published also a volume of sermons in Hungarian (Csurgó, 1887), and has contributed many articles to the "Philologiai Közlöny," "Magyar Zsidó Szemle," "Zeitschrift der Deutschen Morgenländischen Gesellschaft" (including his "Zur Geschichte der Polemik Zwischen Juden und Muhammedanern"), "Revue des Etudes Juives," and "Monatsschrift für die Geschichte und Wissenschaft des Judenthums."